S$150 Credit for Spending S$500 at Marriott Hotels took under 48 Hours to Post! I recently wrote about the amazing opportunity to get S$150 back for simply spending S$500 at participating Marriott hotels in China, Hong Kong, India, Japan, New Zealand, Singapore and Thailand between now until 31 January 2019. If you have not signed up for this promotion, you should definitely do so because getting 30% cashback on your stays is amazing (and probably a very rare opportunity)! 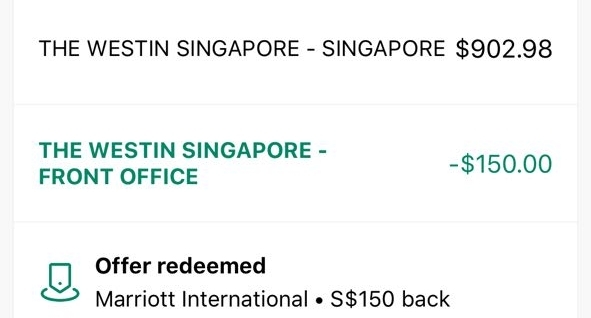 I recently completed a stay at The Westin Singapore and was pleasantly surprised at how quickly the S$150 credit posted. Click HERE to find out more about The Platinum Card from American Express! FHR Rates are excluded from this promotion (according to American Express anyway) and you will have to book a flexible rate in order to trigger the promotion - payment has to be made using an eligible American Express card at the property itself. While the S$150 credit has already been posted in under 48 hours, my points and stay credits are still nowhere in sight. I understand that all Westin-branded properties have undergone a system change over the nights that I stayed there and therefore this might have affected the speed in which the stays are posted (they usually happen really quickly too in this part of the world). As shown in my American Express app above, the S$150 posted together with the charge from The Westin Singapore.